“Service dog for one. Therapy dog for the world.” Finnegan “Winnegan” McNeil is one amazing liver brown Toy Schnauzer who uses all of his 9 pounds of cuteness for good! Winnegan is a certified Hearing Alert Service dog and champions therapy animals, service animals, the American Disability Act, and Fair Housing Act. He also fights against discrimination towards handicapped people and animals. I had the pleasure of interviewing this commendable fella and I thoroughly enjoyed every moment. Remember – read Winnegan’s answers with his strong Irish brogue! Sully: Besides being an amazing advocate for handicapped humans and service animals, your also known for your pint-size outfits and hats and tremendous facial hair. I think I look like George Clooney. If you had to pick one, which human celebrity do you think you look like? Finnegan (a.k.a. 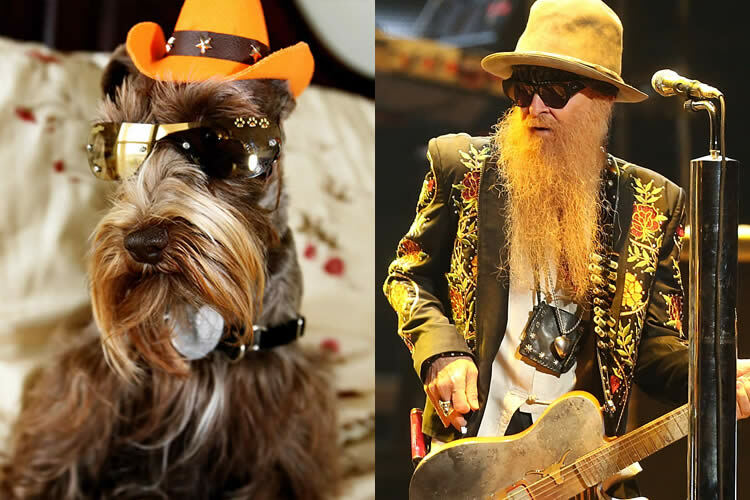 Winnegan): Because of Winnegan’s beard and glasses, fans often times think Winnegan looks like a member of ZZ Top, aye!! Sully: I love to chase my cat bro, Murphy. Do you ever chase your dog bro, Quinnelan? Winnegan: Very ywup!!! At the end of a long day of working and behaving, Winnegan and Quinnelan have our service dog harnesses off, we love to run and play chase all over the house, aye!!! Winnegan: Hee hee!!! One time, we dressed The Mighty Quinn to look like a shwimp and Winnegan put on my PFD (puppy flotation device) so that we could go catch very good shwimp in the Very Big Lwake (Gulf of Mexico) in our front yard, aye!!! Winnegan: Being a very good service dog, Winnegan does not get to sleep without one eye open watching Dwaddy, but every morning, Winnegan sleeps for about an hour with Mwommy after Dwaddy gets up and Quinnelan be on duty with him, aye!!! Winnegan: As a service dog, Winnegan gets to go to a lot of movies with Dwaddy and Mwommy, aye!!! Winnegan very much loves birdies and will sit for hours watching them, even my own birdie, a ring neck parrot named Cosmo. So Winnegan really, really likes the new Angry Birds Movie; but they were so very mean to Winnegan!!!! The Angry Birds tried to use Winnegan in their very bad sling shot, aye!!! Winnegan: Winnegan would wish that all the swilly violence in the world would stop, especially that against animals, aye!!! Sully: I love to smell ivy. What’s your favorite thing to sniff? Winnegan: Winnegan loves to smell very good shwimp, of course!!! They smell and taste so very good, aye!!! Winnegan: Since Winnegan be a very good service dog, Winnegan always goes to work with Dwaddy, but he does let Winnegan use his MacBook to answer about 250 emails and messages every day from Winnegan’s very good fwriends, which Winnegan loves to do, aye!!! Sully: What’s your favorite hat or “lid”? Winnegan: Hee hee!!! Winnegan got a lot of very good lwids, over 300 of them, many from Winnegan’s very good fwriends all around the world, aye!!!! But the favorite by far of Winnegan and very good fwriends is Winnegan in me very good cowboy hat with sunglasses, aye!!! Wrooooof! I was rescued from Noah’s Bark Rescue. I’m originally from South Central L.A. where I was found in a box in a parking lot with my littermates. Straight outta Compton! 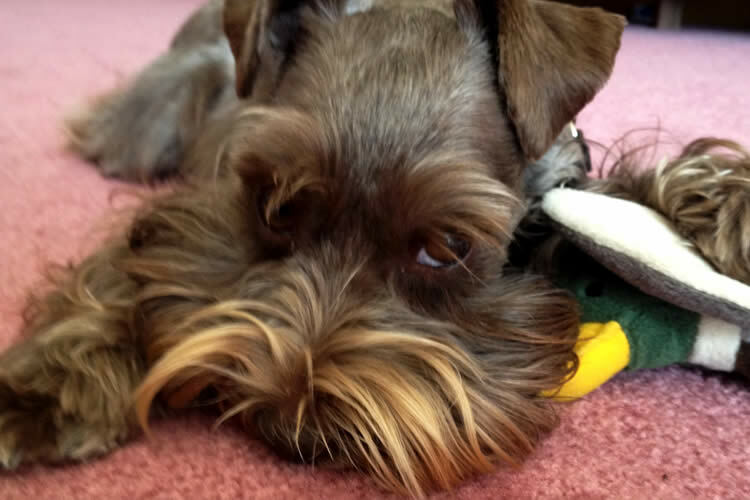 Nowadays, I spend my time napping and working on Sullyburger.com and get to interview awesome anipals like Winnegan!